Students know precise definitions of space, points, lines, and planes. Students can identify collinear and non-collinear points and coplanar points. 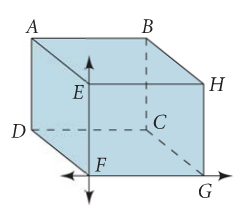 Describe the intersections of two lines and two planes. What is a postulate/axiom? Definition of Postulate: "an accepted statement of fact". Axiom is another name for a postulate. Take the following notes on the given Postulates/Axioms. Step 5: More Practice with applet link for line, line segment, and ray. Go back to the blog and complete the assignment on a separate piece of loose leaf paper.